And yes, that's me (on her television, apparently). 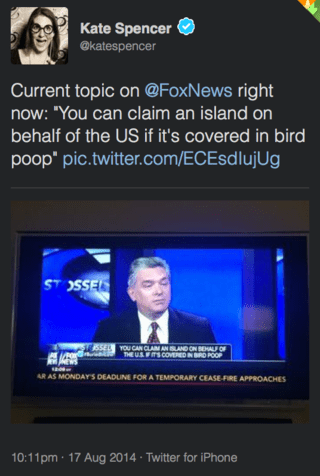 The general theme of the thread that followed was something like "Fox News thinks this bird-poop thing is more important than #Ferguson!" It very well may, but this was Fox Business News and they were just re-running the John Stossel show I was on a few weeks ago (pre-Ferguson, in fact). Now, are they running it instead of covering Ferguson? 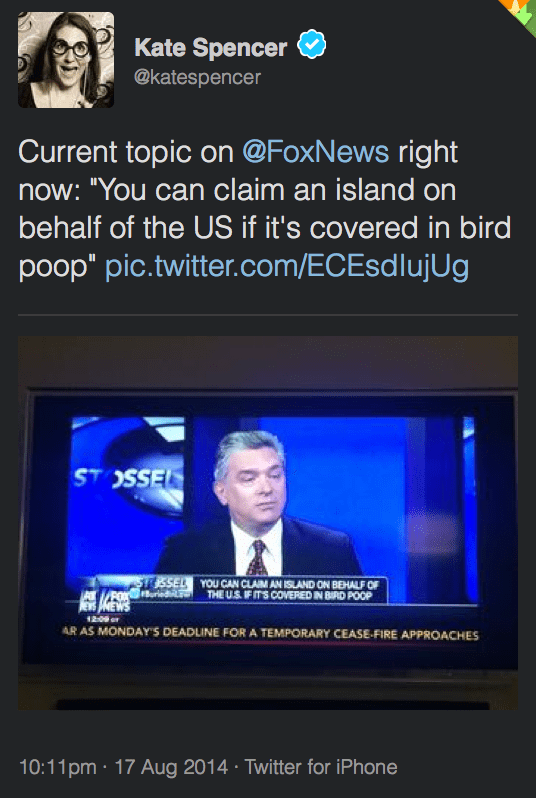 Yes, although this is not the main Fox News channel and I don't think they do live news at all on FBN, actually. And if this had been primarily a news show, they wouldn't have had me on it talking about the Guano Islands Act of 1856. I'm oddly pleased about this, for some reason. If you want to watch that episode, it should be posted on the Stossel site this week. If you watch it instead of paying attention to Ferguson, of course, you are a Bad Person. How Do You Plead? Yadda Yadda Yadda.